May I take the opportunity to thank you and your team for the recent patio construction. Notwithstanding that the finalised patio design appearance is strikingly beautiful and substantially enhances the garden profile, the work was conducted very professionally whilst the attention to detail was first-rate. The team kept me informed of the construction throughout, were friendly and courteous at all times, worked endlessly whilst onsite and ensured that the vicinity was clean and tidy on a daily basis. 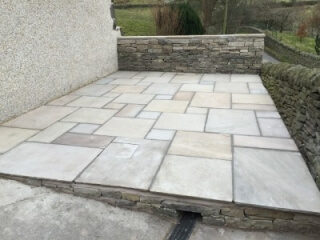 Albeit a variation to the agreed patio specification, I was extremely thankful for you and the team in performing supplementary work to my existing patio in order to renovate the pointing to the same standard employed on the new patio. I would have no hesitation in recommending your company to friends and family as I’m absolutely delighted with the new patio construction. “We’re absolutely delighted with the work you and lads have done on the new patio and paving which has completely transformed the garden. From start to finish I have been very impressed with the quality of the workmanship and attention detail. The job was started on exactly the day you said it would and finished when you predicted it would as well, despite the weather! 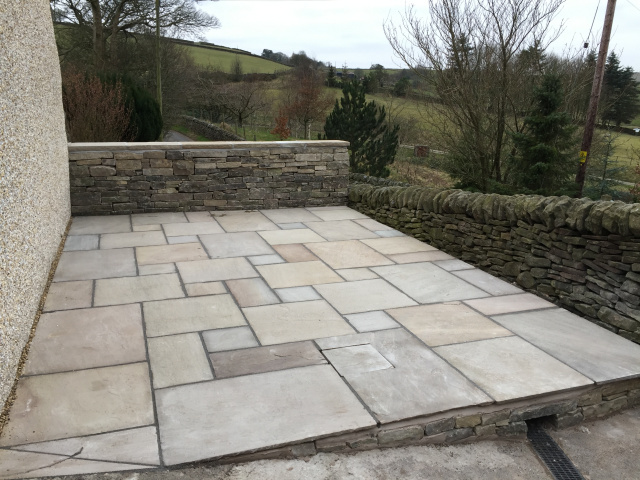 The advice you and Richard provided us with during the work was also much appreciated – you were right about not covering up the stone circles with patio furniture, and they look fantastic when it rains too!! "We would like to thank you, Richard and Tom for a fantastic job on our driveway. From your first visit to assess the job, to the last finishing touches we have been impressed by your professionalism. Everything happened as you said it would and you kept us informed at every step. You all worked so hard, particularly digging up the old concrete and tarmac, whilst taking care not to damage property and plants.Everyone was pleasant and courteous and left everything tidy at the end of each day. We have noticed passers-by admiring you craftsmanship, and we are delighted with the finished product. The transformation is wonderful. We would not hesitate to recommend Paul Gibbons Landscapes. It has been a pleasure to do business with such a good local company. Thanks again." I just wanted to drop you a line regarding the installation of our new driveway over the last week. 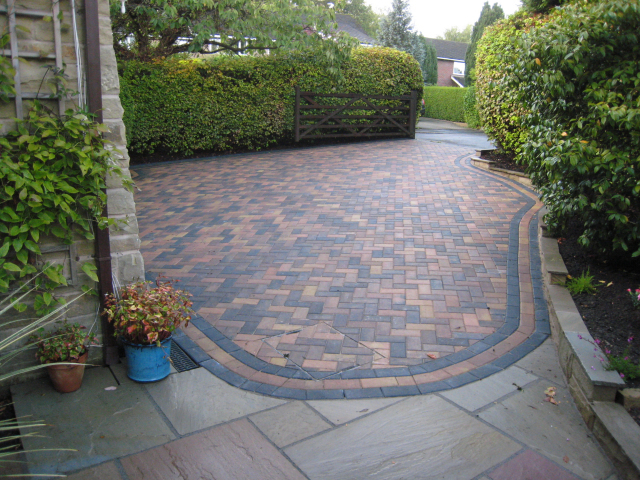 You and the lads have done a fantastic job, the driveway looks great. In this day and age we are quick to complain when things aren’t right but not so quick to praise good work. You and your team worked really hard in bitterly cold conditions. You arrived early every day and got cracking. You were all very considerate, courteous and as neat and tidy as you could be whilst digging up and relaying a drive!! When you left, the whole area was cleaned and left as you had found it. We are delighted with the drive and really glad we chose a you to install it. I would gladly recommend you to anybody who might be considering any work in the future. A first class professional job, thanks again and well done." "I would like to thank Paul Gibbons Landscapes Ltd for making an excellent job of ‘re-making’ our front garden – making it safe and easy to manage for us, as older people. We would the staff extremely helpful and polite, and they understood our needs and plans completely. We would not hesitate to recommend this trustworthy company of landscape gardeners!" "From start to finish I have been very impressed with the professional attitude and efficiency of Paul Gibbons and his team. They arrived as arranged on January 5th and worked tirelessly, often in cold, wet conditions to complete the work on time. I could set the clock by their arrival each morning and they wasted no time in settling down to the work in hand. They were always most pleasant and courteous and eager to please. They never complained and they worked well as a team. They were conscientious and obviously committed to doing the work which was of a very high standard. Paul is obviously very much respected for being a good boss who treats his staff fairly and they in turn give of their best. I was most impressed with all the preparation work which was meticulous and which has ensured an excellent end result. I must also comment on the fact that everything was left neat and tidy at the end of the day and nothing was too much trouble. 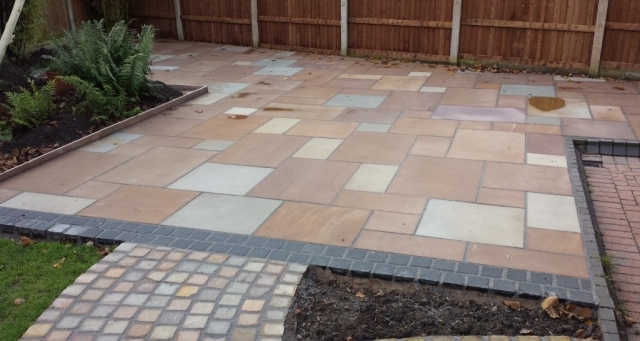 I am delighted with my new paving and love the colours of the Indian stone. I am now looking forward to renewing my patio at the back of the house eventually. I have no hesitation in recommending Paul Gibbons Landscapes to anyone who asks. Thank you for an excellent job – well done!" "Comprehensive details given of work to be carried out and when this would take place. The staff arrived on time, were very pleasant and worked very hard, and carried on at times in the rain. We were kept informed of the progress of work at all times. The site was kept tidy and importantly the staff tidied up at the end of each day. We were very impressed by the standard of workmanship, the staff doing the work, the efficiency of the staff, and the work was finished on time. We are overjoyed by the result, and have had lots of complimentary comments from neighbours and passers by. We would certainly recommend Paul Gibbons to all our friends and neighbours. Thank you to you all for an excellent job." "We would highly recommend Paul Gibbons Landscapes Ltd. They have made us a wonderful patio. They arrived on the date the job was booked in for, cleared up every evening and completed the job on time’. "We were very pleased with the quality of the work carried out by the company. There was a good, reliable, working relationship established between the company and client." 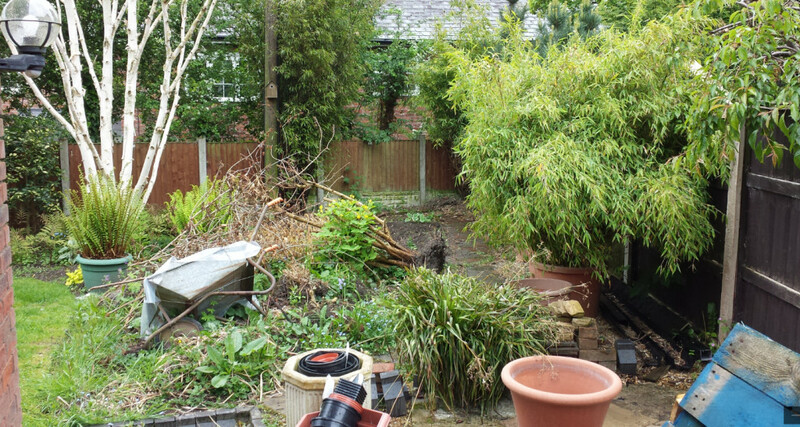 "We were delighted with the work Paul Gibbons and his team did on excavating part of our garden and building two low garden walls in readiness for a conservatory to be added to the back of our house. We were impressed from the start when Paul Gibbons came to quote when he said he would, sent us the quote very promptly, and turned up with his staff ready to start on the date in January that had been arranged some months previously. Despite bitter cold, and rain, and one day when snow stopped work, the job was completed exactly on time, and at the price quoted. 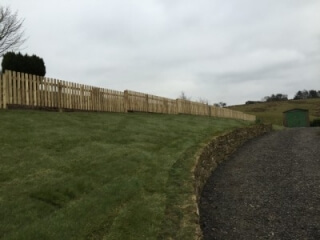 Paul Gibbons and his team were very pleasant, worked very hard, and left the site tidy at the end of each day. We were impressed that Paul Gibbons ensured his staff had proper breaks, and at the end of the job he himself did the final clear round of the site and wanted to be sure we were happy with the work that had been done. 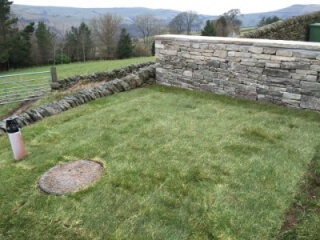 The finished garden walls have been completed to a very high standard and the overall effect is very pleasing and has already drawn admiring questions and interest from passers by, wanting to know who did the work. 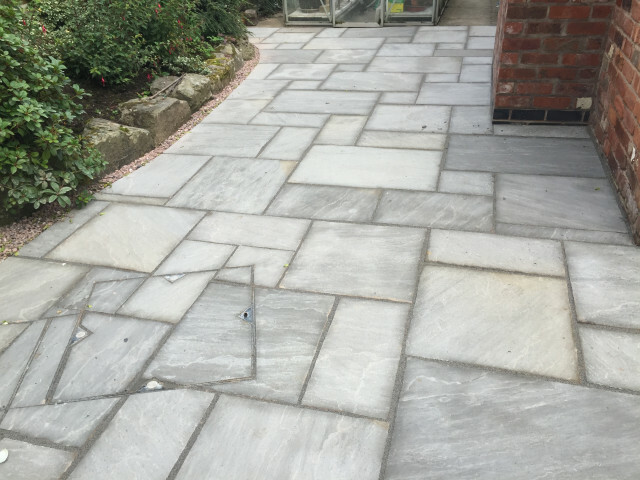 We are more than happy to recommend Paul Gibbons Landscape Gardeners to anybody and are looking forward to having him and his team back to relay the paving once our conservatory is built. " 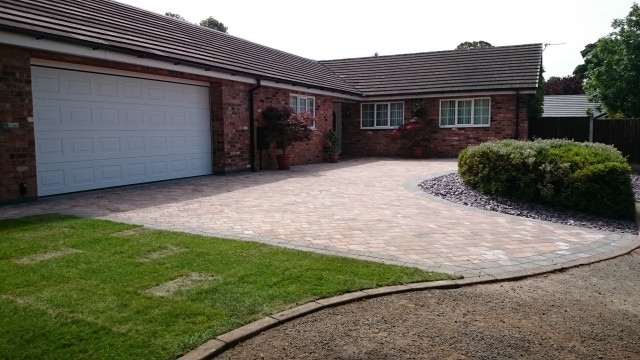 "Having had our garden landscaped by Paul Gibbons several years ago, we recently employed him again, to construct a new driveway. On both occasions, we found the whole operation to be completed in a very professional manner and the work itself to be of a very high standard. We already have done, and will continue to recommend Paul Gibbons Landscapes to our friends and neighbours." 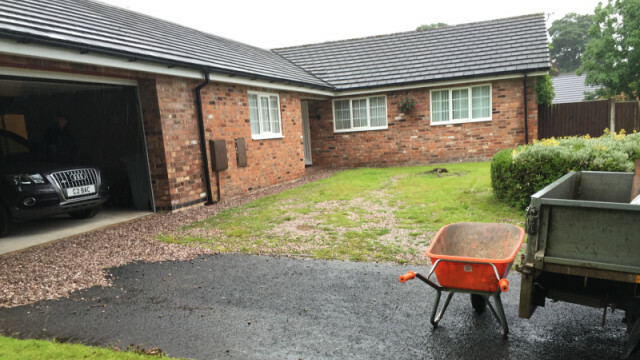 "I was very pleased with my new drive that Paul Gibbons and team made for me, they started work on time each day, they were very polite and respected my home, they cleaned up their work space every night. I would recommend them to anyone, everyone who has seen my new drive have been very impresed. Thank you Paul Gibbons and team for a fully profesional job done, I was also impressed that the quote given to me was the exact price in which I paid. Once again thanks Paul and team." "The front drive and rear garden path were relaid on time and in accordance with the quoted price. The staff used were excellent, courteous and above all knew their trade thus leading me and my wife to be highly delighted by the finished result. Having personally spent many years in the building trade appointing all types of trades from groundworkers to painters I would have no problem in awarding them (Paul Gibbons Landscapes) another contract or recommending them to anyone." "We are very pleased with the overall effect. Small changes were carried out promptly and in good grace. We would certainly recommend them to others." "I am very satisfied with the work carried out. The staff were extremely pleasant and helpful. The work was completed on time and the price quoted was honoured." "We would just like to thank you for the beautiful job you have done on our new patio, which was laid with a minimum of disruption. This has transformed the back of our house. The Indian stone looks very striking in the Autumn colours which you recommended. I am sure we will have a lot of enjoyment sitting on the new patio once the warmer weather arrives." "We are totally thrilled with our new front drive and particularly appreciated how ‘hassle free’ Paul Gibbons and his workers made it. We are so pleased that we have booked in to have the back garden re-paved next year. It is a pleasure to have work done on time and of such a high quality – we can’t recommend them too highly." 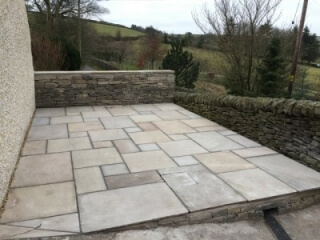 "Having recently laid our patio, we were greatly impressed by your hardworking and conscientious workforce, punctual, polite and committed to the job to completion. A firm recommendation from us." 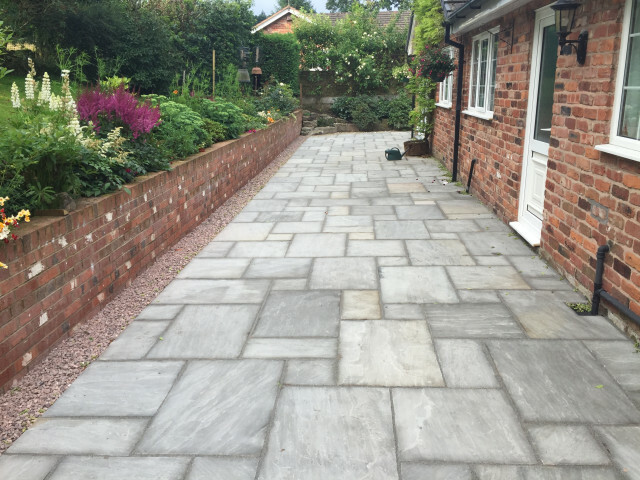 "Paul Gibbons and his team undertook the landscaping work to our new rear patio and front drive to an excellent standard. 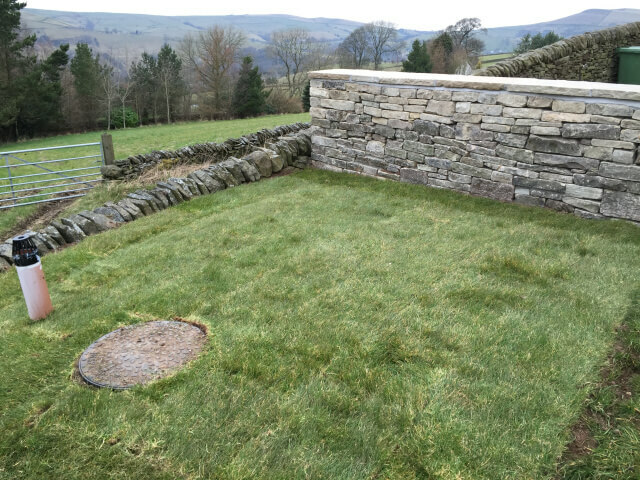 We are very pleased with the numerous design touches they have incorporated to our basic outline ideas and it goes without saying that the work was done to programme and to quotation without any hassle." "We were impressed with Paul Gibbons and his team on several counts. They built good support with us from the outset and were a pleasure to have around. Paul listened carefully to our requirements and used his experience to guide us to making sensible design decisions. The quality of workmanship was very high. Not only does the finished product look good, we know how much effort went into preparing the patio and driveway foundations. It’s not going to budge! The quoted price was competitive with other contractors and importantly, the original price was kept to." "We found Paul and his staff helpful, flexible and considerate at all times. 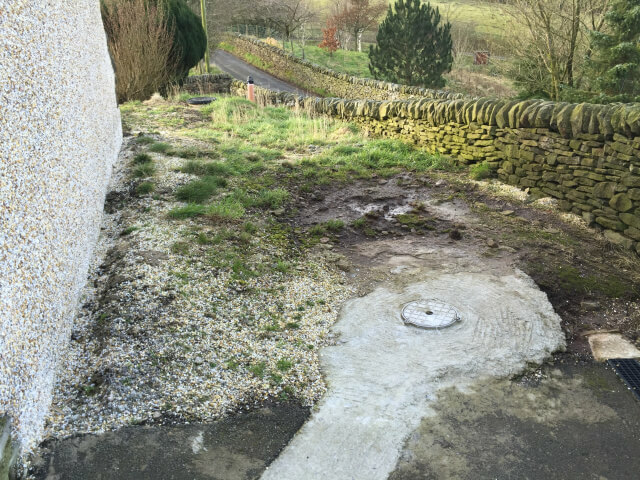 They carried out a first class job and we would happily recommend them." "We used Paul Gibbons Landscapes Ltd 3 years ago to landscape our rear garden, we were really pleased with the results, which was completed on schedule, we therefore had no hesitation in using the company again recently to our our front driveway, which was again completed speedily and efficiently, we highly recommend thier work." "We were more than happy with the work. Teams approach to the job and general attitude, despite bad weather conditions. We were more than pleased with the extra finishing touches which were not in the original quote for the job. 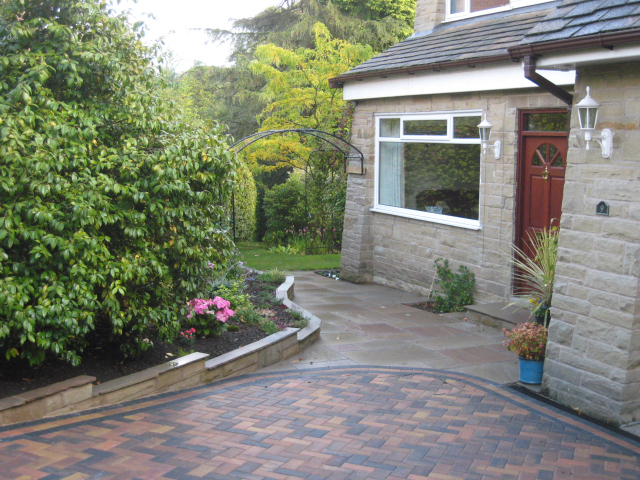 We would recommend Paul Gibbons Landscapes to friends and neighbours." We will provide the same standard for you, so call us now on 01625 616281 or use the quick enquiry form on the right hand side and we’ll get in touch as soon as possible.